The box contains 15 sterile strips. I’m just excited about the free toy inside. 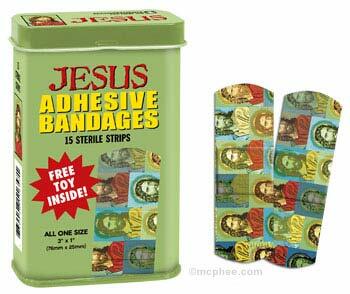 I object to the “All One Size” idea, as if Jesus were a “once size fits all” kind of bandage. Need your wounds healed? try Jesus. PS: can I have permission to use this pic on my blog? yah!!! we have to keep our body in scars and to use some protector but we have also to trust god…… thats true!!!!! !